Tybee Pier at sunrise on Savannah Beach. The Salt Table is proud to present this extraordinary photograph of Savannah, Georgia. This beautiful image is from The Savannah Collection, an important set of photographs developed over time by the husband and wife team of His and Her Photographs. Jonathan D’Arts and Marlene Bauer have captured the visual essence of Savannah in their exhibition at The Salt Table shop located in the Historic District of Savannah, Georgia. 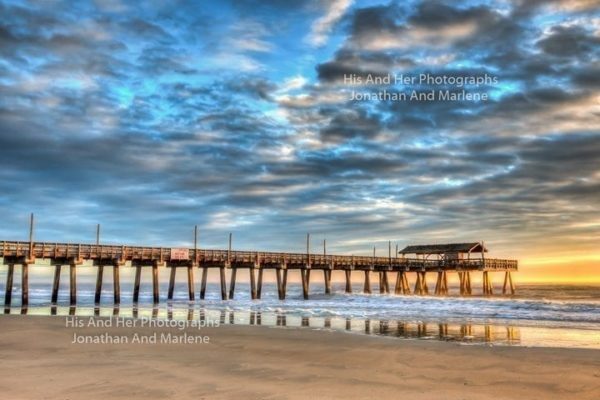 This beautiful image and many more are available to purchase online in a variety of media and sizes up to 32×48” framed. Durable construction, 1 1/4″ depth, Finished Back: No staples. Perfectly clean look. Every gallery wrap comes with a sturdy, black backer board. Hanging hardware is pre-installed. Eight-Color Inkjet Printing: Pigment based inks for exceptional fade resistance. Please allow 2 weeks delivery of the photographs. Paper prints will arrive via USPS & canvas via UPS.